They say that imitation is the best form of flattery. A friend of mine…regularjoe on Flickr…took a picture recently of a train on the tracks. Ever since then…I have been on the lookout for a similar situation because I absolutely love that picture. 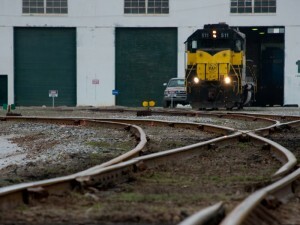 As I was driving through Panama City yesterday, I saw this train preparing for departure from a large industrial site. It was the perfect opportunity so I stopped for a couple of shots. Ideally, this shot would have taken place during a different hour, but the overcast setting seemed to add a little something for me. Shot with a Nikon D80 with the Nikon DX AF-S Nikkor 18-135mm1:3.5-5.6G ED lens. What do I think about when I see this image? I find with many creative mediums (my active blogging being one of them), you tend to imitate styles that you find appealing as you search for your own look or voice. This is one of the easiest ways to get started with creative forms of expression like blogging or photography. There is a lot of great work out there, and as you find pieces or sites that you feel an attachment to…use that as a basis to start your own journey. As you imitate (not copy) others, you will find what works for you and continue to expand on that. Over time, you will have found your own voice, look, connection that defines more of who you are…rather than the artist/blogger you were originally imitating. You know Robb, I actually wrote about this subject earlier today on my own blog. Your blog post has given me some food for thought, I feel you have made lots of very interesting points. In fact, I wish I’d read it earlier, before writing my own blog post. – driving101.